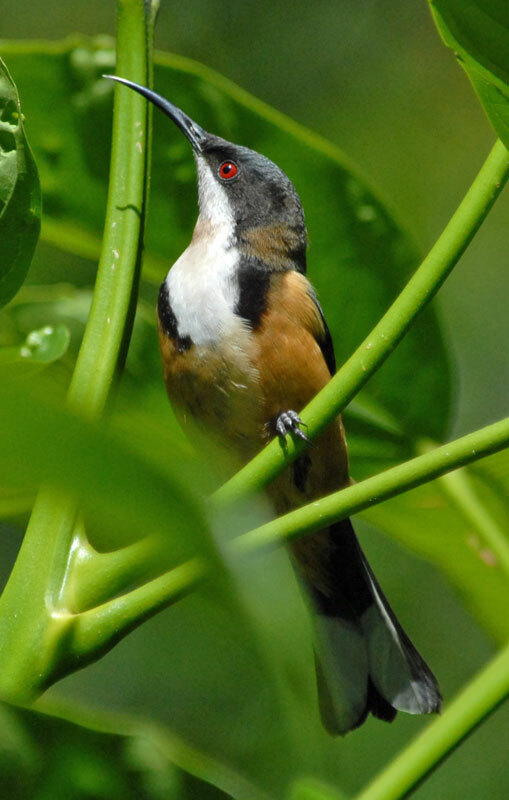 When first described, the eastern spinebill was placed in Certhia, a genus of treecreepers. It was soon transferred into the honeyeater family Meliphagidae, a much more comfortable fit for this small, dapper bird. Although quite common, spinebills are infrequent visitors to this garden. They appear to trigger the rage circuits in the Lewin's honeyeaters, which chase them as soon as they spot them. This and their incessant activity make them difficult to photograph, but I managed to get this one while it was still deciding its next move. It's a fabulous photo and a quite striking bird! I hope it is able to stick around your place for a while (before being chased off). He's a stunning looking little bird! The only bird remotely like this that we get is the Ruby Throated Hummingbird. Beautiful bird and great photo. That's one that I still want to see! I think that they must make other honey eaters jealous! They get harrassed by ours as well. Nice catch! I'm not happy with any of my Spinebill shots. Given how relatively common it is, I find it a very difficult bird to photograph. Noice shot - they're frantic little fliers, if the little weztern spinebills are similar to judge by..
We have the little westen spinebills abouts in the southern forests on sandier areas - especially around kangaroo paws. As always, the females have the dull brown frock while the lads are dapper in their fancy nutmeg brown suits. They really do their patch of kangaroo paws over.. So, if you are over here, and if the Anigozanthos spp. are flowering - do keep an eye out from them. Mick, they really are exquisite. I hope you get to see one soon --- you won't be disappointed! 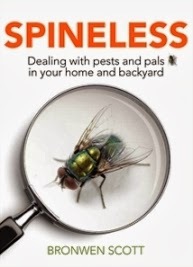 Nanjude, I thought about the jealousy aspect, but I think the bigger honeyeaters beat them up just because they can! Dave, sure is! The honeyeater family contains some speccy birds. They're all very neat. Mosura, getting that photo required a lot of luck. They seem to like hiding in among the vegetation --- probably because of the feathered thugs. A pair of dusky honeyeaters visited the other day. Had no luck at all with those. They were even more active. Neomyrtus, I've never seen the westerners, so I will certainly be staking out patches of kangaroo paws next time I head over that way. In the SE, the easterners go crazy over correas. There's not much native flowering in the garden at the moment, so I think this one was after insects. Beautiful, and such an interesting appearance. Your photo shows the bill to good advantage.